The Converse Blog: The Converse Blog's Weapon Wednesday: Kobe in Converse. The Converse Blog's Weapon Wednesday: Kobe in Converse. Short post today folks, my Grandmother fell in her Kitchen yesterday. So she's kickin' it at the hospital today and I am going to go spend some much needed time with her. So I'll leave you with this photo from a few years ago, you'll see Kobe rocking the Magic colorway of the Weapons...in a Game. I can't tell how amazing it was to see that a few years ago. Sorry for the tagged photo, it was the only one I could find on short notice. Thanks for checking out the blog, check back Friday for some Friday Flashback. That is insane. I never knew about this. Hope your grandma is OK. Your photo is from the 12 November 2002 Lakers-Hawks game, which the Hawks won. That game was the only NBA regular season game that Kobe wore Converse, though he wore the same Weapons in the 4 August 2002 Teen Choice Awards and for promotional photos on September 2002. You can find other photos of Kobe in Converse Weapons at Getty Images. Your photo is from the 12 November 2002 Lakers-Hawks game, which the Hawks won. That game was the only NBA regular season game that Kobe wore Converse, though he wore the same Weapons in the 4 August 2002 Teen Choice Awards and for promotional photos on 30 September 2002. 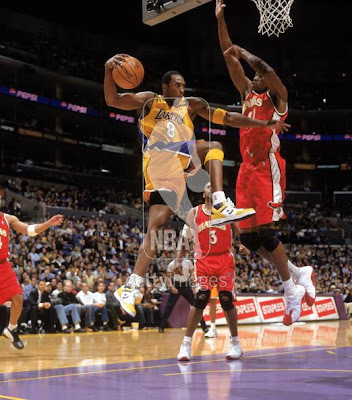 You can find other photos of Kobe in Converse Weapons at Getty Images.